When Cambridge-based power tool accessory and industrial band saw blade manufacturer C4 Carbides Ltd needed to extend its cleaning regime to meet the demands of ever-increasing production, the company didn’t hesitate to order two new aqueous cleaning systems from MecWash. One of the Tewkesbury-based company’s bespoke washers has now been installed with the second one due to be added shortly – ensuring C4 Carbides Ltd can continue delivering its growing number of orders without compromising on product quality. C4 Carbides manufactures tungsten carbide and diamond coated power tool accessories and industrial band saw blades, which are exported across the globe. More than 90% of its output is currently destined for overseas markets including the USA, Europe and the Asia Pacific region. The company, established by current CEO Peter Nicolson in 1985, has established a reputation for developing innovative products using cutting edge brazing technology. Chris Norman, Process Engineer, at C4 Carbides Ltd says: “Effective cleaning plays an extremely vital role in our manufacturing process. The nature of our products demands that we achieve an extremely clean surface prior to applying the tungsten carbide or diamond. Any oil or dirt residue remaining from the production process has the potential to significantly impact the quality of our product, which in turn, could adversely affect our reputation. “We first invested in a MecWash Duo back in 2012 and it has been delivering excellent cleaning results up to the present day. “In recent years C4 has experienced unprecedented demand and we were also keen to have a common cleaning approach across all of our manufacturing processes. This led us to contact MecWash again, who recommended we install two custom-made washers. “These washers provide a continuous cleaning process which is vital for a manufacturer like us where production takes place 24/7and any downtime we incur would lead to higher costs. MecWash specialises in designing bespoke aqueous cleaning systems for components used in a wide range of manufacturing industries, including automotive and aerospace as well as for general engineering applications. Managing Director at MecWash, John Pattison, says: “It is always pleasing when a customer returns to us as it confirms that our systems are delivering the required results. As a company, we specialise in providing bespoke systems and these washers were developed and built specifically to meet C4 Carbides’ requirements. “The reliability of our systems and the fact they can cope with round-the-clock operations makes them an excellent choice and is why we continue to see customers return again and again when they need to expand or improve their existing cleaning regimes,” he added. 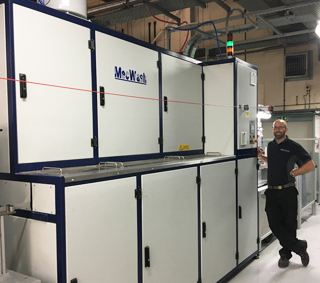 Chris Norman continues, “We are really pleased with the results we’ve seen since installing the new MecWash washer and can’t wait to complete the commissioning of the second washer. The service offered by MecWash has been excellent, their team has been very helpful and knowledgeable which has ensured we achieved our budget and installation targets. “It seems such a long time ago now when I think back to how we routinely used solvents to clean the cutting tools. I’m glad this unpleasant and time-consuming process is firmly confined to history and we are continuing to move forward with this proven technology from MecWash. I would definitely recommend installing one of their systems,” he added. For more information on MecWash products and services, please visit www.mecwash.co.uk or call 01684 271600. Pictured top is Chris Norman, process engineer at C4 Carbides Ltd, with the two new aqueous cleaning systems from MecWash and below are some diamond jigsaw blades produced by the company.